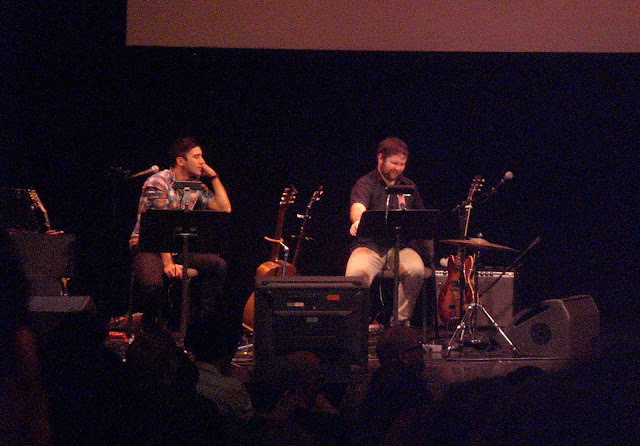 A couple months ago, Jenn sent around an email about an event at BAM somehow involving (my love) Sufjan Stevens. Not wanting to miss out on another BQE, Kurt, Christian, and I agreed to go without really grasping the details. Apparently Jenn was the only one who really knew what was going on until we convened at the BAM Opera House. Turns out we would be watching a documentary on the screen while Sufjan and another musician (Raymond Raposa of the Castanets) would be playing the soundtrack. I think my favorite part of the night was when Kurt leaned over to me and said, "Now, which one is Sufjan?" Great. Didn't I just go 400 miles to see Kurt's favorite band...again?! He can't even identify one of my favorite artists?! Jeeez! The film was called Beyond this Place and documents a "son's attempt to reconnect with his perpetually stoned father by taking a 500 mile bike ride through the Pacific Northwest." I can't say it was the most exciting hour and a half I've ever spent but it wasn't too bad. The topic wasn't so interesting or relatable but the film was done pretty well. The music was good but really only in the background. I think I enjoyed the Q&A with the director more than the actual movie. It was interesting to hear about his motivation for starting the project and how his relationship has changed/not changed at all with his father. Eventually we learned that Sufjan and the director grew up together in Michigan and that was how they ended up collaborating. Needless to say, the evening was nothing what any of us suspected, but it was great to get out and do something different. Thanks for the heads up, Jenn!